Steve "Lips" Kudlow. Photo by Andrew Stuart. Anvil has been around for a long time. Formed in 1978, they released their first studio album entitled Hard’n’Heavy in 1981 and they’ve been recording ever since. They had their ups and downs, though. They achieved fame and notoriety initially, but due to self management and an unforgiving industry, they have been oscillating in and out of the public’s eye, making almost nothing off their albums in the process. For around thirty years, they toured in search of a record label that would sign them, to no avail, which is kind of silly considering the huge impact they had on the metal genre (being cited influential to bands such as Guns n’ Roses, Metallica, Anthrax and Slayer to name only a few). However, with their ongoing popularity overseas coupled with the self release of their 13th studio album appropriately titled This is Thirteen (2007) and the catalyzing success of the movie Anvil! The Story of Anvil (2008, dir. Sacha Gervasi), the band resurged and gained the acclaim they so badly deserved. Anvil. Photo by Andrew Stuart. Arguably the hardest working metal band in Canada — hailing from Toronto, Ontario — Steve “Lips” Kudlow (lead guitar, lead vocals), Robb Reiner (drums) and co. (the lineup has varied over the years) are proof that determination and perseverance do pay off, eventually. Since then, Anvil has been touring regularly across the world, hitting festivals such as Download and SXSW (and stopping at venues in Canada from time to time), making cameo appearances on Sons of Anarchy, having song clips featured on The Simpsons (Season 22, episode 5), performing on The Late Night Show with Conan O’Brien (Season 1, episode 80) and even having songs featured in Rock Band 2. They’ve been a prominent act at the internationally renowned Wacken Open Air festival and are featured in the documentary WACKEN 3D – LOUDER THAN HELL, which is now playing in Canada. 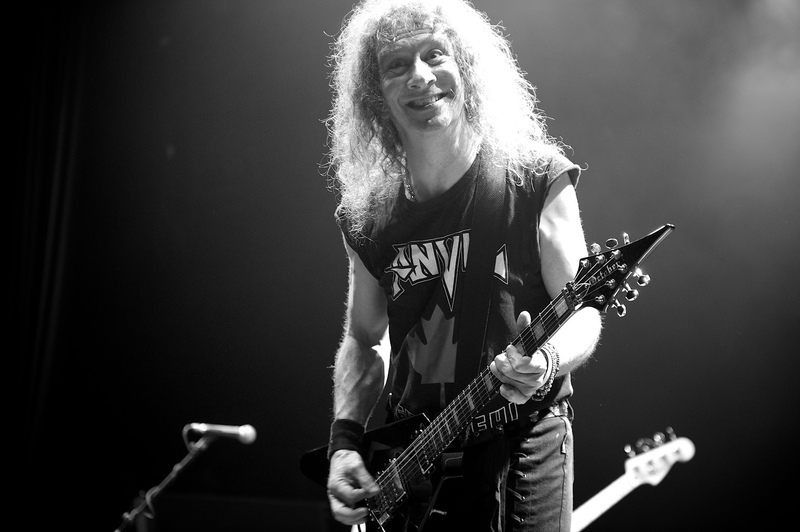 Now, the band is recording their 16th studio album Anvil is Anvil, which is set to release sometime in early 2016. I was lucky enough to get some time to Skype with ‘Lips’ from Germany where he was just finishing up the recording portion of the album. We talk about his new album, the Wacken Open Air festival and in a bonus round of quick questions, I find out he does a spot on impression on Austin Powers. “I’m excited as hell,” says Lips about his forthcoming album. “ We got it pretty much done in about three weeks, top to tail. We went in very prepared and we got it done quickly and efficiently.” This time around they enlisted the help of producer Martin Pfeifer, who has recently done work with German heavy metal act U.D.O. on their album Decadent (2015). “Hey, listen I’ve been doing this for a long time,” he says laughing – I can immediately tell he’s a very down to earth person and easy to talk to. I ask if the writing process has changed much over the years: “We’ve had a number of different approaches in how we’ve gone about the writing process— but generally speaking it’s still bound to the same thing.” He tells me that in the ‘90s they used to do preproduction on a four-track recorder with a drum track before entering the studio. He reflects that this method was a waste of time however, and now they write up the album in the rehearsal space and go directly to the recording process afterwards. One of the most interesting things about the new album is how it’s being sold. This time around, they’re using the crowdfunding site PledgeMusic (you can still pre-order the album here in Canada until November 1st) to bypass record labels and reach out directly to the fans. There’s something for every price range and the package vary based on how much is pledged. Items included in the package range from signed CDs to original artwork painted by drummer Robb Reiner. European fans in particular had a rare opportunity to sing back up vocals on the new album with their preorder. “It was absolutely incredible” says Lips, “we had about 15 people — and they came from all over Europe — everywhere from Sweden, Italy, Germany, Belgium — it was just crazy (laughs).” The dedication of these fans is notable, he tells me, considering the fact that none of them had never been in a recording studio before. On top of that, they had to sing melodies and learn lyrics to the songs on the spot. Steve “Lips” Kudlow. Photo by Andrew Stuart. We then spoke at length about the album titles that are hallmark to the Anvil identity. I noted how they keep to the same formula and how it gives a hint to the humour they have in their songs. He related how the titles of the albums are chosen with care in an effort to remain consistent and how they run parallel with the bands style. Favourite food? : Weiner schnitzel. I’m in Germany, I can’t help it. You’re stranded in a space ship, lost forever. What are three things or people you would need with you: My guitar, my wife and my son. Anvil is Anvil is set to release sometime in 2016, date TBA. WACKEN 3D- LOUDER THAN HELL screens in Canada October 29, 2015.